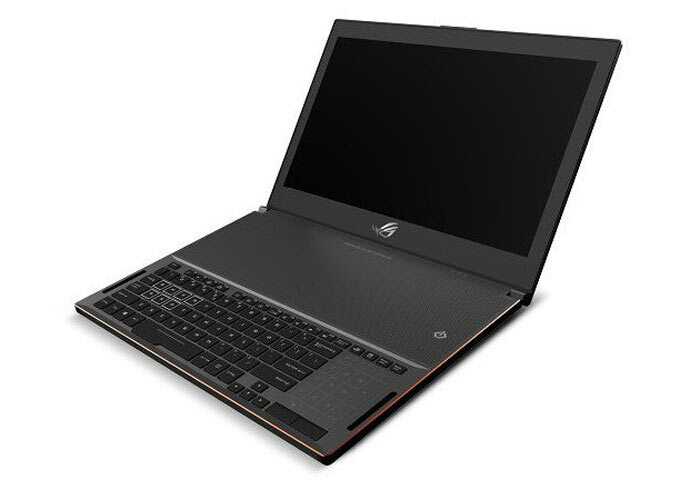 An Asus ROG gaming laptop which combines powerful components and a very slim profile has been spotted. Laptop news site LaptopMedia spotted the device listed as having won a Taiwan Excellence Award for 2017. The new Asus ROG laptop offers a most impressive specification with a surprisingly slim profile. The machine is dubbed the GX501, so it's a refresh of an older model. However, the pictured device doesn't look much like its ancestor. Inside the new Asus ROG GX501 there is a latest generation Intel CPU, likely to be a Core i7-7700HQ thinks the source publication. This machine is built around a 15.6-inch screen with 4K UHD (3840 x 2160 pixels) resolution and Nvidia G-Sync support. Previously people pondered over the value of such high resolution screens in gaming laptops but Asus is leveraging an Nvidia GeForce GTX 1080 GPU which will definitely be up to some 4K gaming action. As per the headline, probably one of the most eye catching specs of this impressive laptop is its thickness. Asus has managed to create the 'thinnest laptop ever with an Nvidia GeForce GTX 1080 GPU' installed. It is said to be just 16.65mm thick. Compact form factors usually need special cooling considerations, and looking at the picture there's what looks like a large perforated area above the keyboard which is probably designed to let warm air rise quickly away from your PC. In other specs revealed we see that the system supports up to 24GB of DDR4 RAM and is equipped with a PCIe x4 NVMe SSD. The picture also shows a very interesting keyboard / numpad layout where a numpad grid can be toggled to function within the touch-pad area to the right. At the time of writing the Taiwan Excellence Award website designers seem to have removed details concerning the Asus ROG GX501. Pricing and availability are as yet unknown. That thing is gonna throttle like a mofo, even current GTX 1070 and 1080 laptops throttle pretty considerably. Too much (and dated looking) bezel. I agree that the huge space between the keyboard and the screen is a bit odd. No touchpad either? That's odd. That space between the keyboard and screen is very odd as well. The picture also shows a very interesting keyboard / numpad layout where a numpad grid can be toggled to function within the touch-pad area to the right.